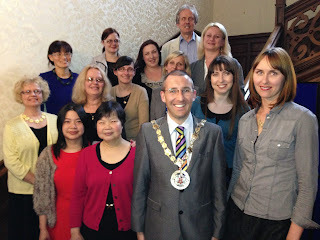 I welcomed local people from across the world to Bangor Castle Town Hall on Monday 12 May 2014. I was proud to extend the invitation and welcome local people from Poland, Russia, Estonia, Kazakhstan, Latvia & Hong Kong to our Town Hall as Mayor. I am delighted they have chosen North Down to be their home and stand with them as valued citizens of our Borough. I greatly appreciated each persons story about why they chose to live here and feel extremely grateful to have so many different people from different backgrounds living in our diverse Borough. I stand with them in the face of recent attacks and against hate and intolerance. Northern Ireland is changing and different people with different backgrounds help make us stronger, prosperous and a better place to live. Mayoral praise for "Mr Holywood"